Designed to connect two Cat5e patch cables together. 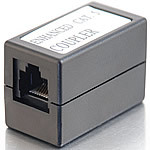 Capable of handling LAN speeds of up to 100Mbps, meets TIA/EIA 568A and Power Sum Certified, the Cat5e coupler will meet all of your performance requirements. This 2-port passive splitter is a handy item when you need another network connection but don’t have the time or the money to add another cable drop. Simply plug one device to your work area network port and another unit to the corresponding patch panel port. Now you can run two network devices over the same network cable. Sold individually, this item must be used in pairs for each installation, one on each end of the cable.